Welcome to the Upper Moreland Historical Association Online! Upper Moreland Township is located in Montgomery County, PA, approximately 17 miles northwest of the city of Philadelphia. 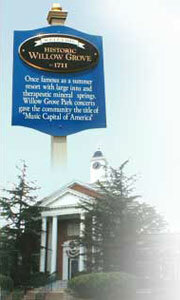 Important events in the area date back to the Revolutionary War, and in the early 20th century, a park in the little town of Willow Grove became world-famous. We are dedicated to preserving the history of our township, its landmarks, and its inhabitants. Please take time to look around the site. We have a great deal of interesting and worthwhile information about Upper Moreland here, as well an ongoing educational programs and fun events. Below is a quick overview of our organization and what we do. For quick navigation, use the menu bar above for more details about our various endeavors. Enjoy the site! Reservation Forms for the 2019 Dinner are now available: download here. Please note the date is April 30. An incorrect date was previously posted, and that has been fixed. The role of the Upper Moreland Historical Association in the community is the collection, preservation and stewardship of our history, folklore, and culture. Our mission includes the commitments to foster an appreciation for local history, to promote an interest in the area's past events, people and unique cultures, and to instill a sense of pride in the heritage of our community. So, how exactly do we go about doing that? Our Events, Tours, and Publications offer a little taste of the history of Upper Moreland. We hold general public programs with guest speakers once a month, January-May and September-November. In addition, we host several picnics, tours, and community events throughout the year. To see what's coming up next, have a look at our current Programs schedule. Our various committees research, catalog, and maintain: our archives and museum collections, listings of local historical sites, genealogical resources, oral histories, the history of local businesses, memorials of local military veterans, and numerous publications about our rich local history. For more information on our resources and current activities, visit the Committees links to the left. We are always looking to broaden our knowledge of the area's colorful history and expand our collections, so if you have historical information about the community, have artifacts you wish to contribute, or have anything that will help us to fulfill our mission, please contact us. You can e-mail any officer or committee chairperson directly from the Membership & Contact page.